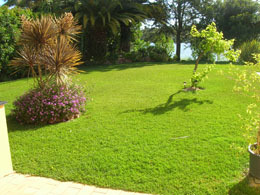 Lawns are very much quintessentially English and with a mixture of varieties, a lush green lawn can be attained here on the Algarve. From seed to laid turf, again, preparation is the key to a successful lawn. Top soils, peat, manure, fertilizers and irrigation are all essential when planning a lawn - plus also an estimate of your ongoing water bills if you don't have a private borehole. Once your green carpet has been laid or seeded, ongoing maintenance is essential. Monthly fertilizers, cutworm prevention, irrigation checks, scarifying, as well as an adequate lawn mower and strimmer are required. 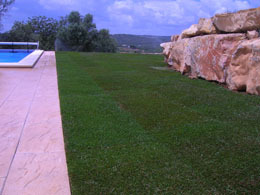 We have vast experience in laying new or reinvigorating old, weed-ridden lawns - or replacing with one of our many gravel gardens on the Algarve. If you just need advice on using the correct products for your lawn, you can get a full diagnostic report on your garden from as little as 90 Euros.